Arabella Dempsey had expectations from her wealthy Aunt Osborne with whom she has lived for the past twelve years. When Aunt Osborne marries a fortune hunter decades younger than she, Arabella’s expectations of being her aunt’s heiress are disappointed, as are her expectations of the attentions of Captain Musgrave, her newly acquired uncle. Arabella returns to her family in Bath, but home is no longer the site of her memories. Her father’s health is failing, her sisters are little more than strangers, and the genteel poverty in which they live persuades her that she must earn her living. The only thing that makes Bath endurable is the presence of her dear friend, Jane Austen. Against Jane’s advice, Arabella accepts a position as junior schoolmistress at Miss Climpson’s Select Seminary for Young Ladies. As she concludes her interview with Miss Climpson, she finds herself literally knocked off her feet by Mr. Reginald Fitzhugh, who is delivering a Christmas hamper to his younger sister, a student at the school. Recognizing the affable “Turnip” by his waistcoat, “a masterpiece of fine fabric and poor taste,” Arabella reminds him that they have met, but an experienced wallflower, she is unsurprised and unoffended by his having forgotten her. The attempted theft of a Christmas pudding with an attached note—in French—that orders “Meet me at Farley Castle, tomorrow afternoon. Most urgent” begins a series of shared adventures. The note leads them to a frost fair in the ruins of Farley Castle where they find another Christmas pudding, this one in the marble hand of an effigy, with the clue written on ribbon. More puddings and more clues follow. Complications include a mysterious list, several suspicious characters, a chaotic Christmas pageant, and the twelve days of Christmas festivities at Girdings House, home of the Dowager Duchess of Dovedail. But the journey the mystery sets them on is secondary to the course that leads to love. Some fans of Willig’s Pink Carnation series will doubtless miss the contemporary frame story of Eloise and Colin, and those who prefer ample lacings of darkness and love scenes with heat may be disappointed. But most of Willig’s fans, or at least those that waited for the paperback release, will remember the amiable Turnip, “long on looks and short on brains,” and enjoy him as a different kind of hero in this series. For those who have not read Willig but enjoy historical romance that evokes smiles and sighs, I highly recommend this book. I always find a special delight in books that cause me to imagine the author smiling with pleasure as she creates the adventures of her characters. This is such a book. Reading it is great fun. First there is Arabella and her circumstances lifted straight from Jane Austen’s unfinished novel <i>The Watsons</i>. In TMOTM, Jane is inspired to write the novel by Arabella’s story. It’s also marvelous to see a wallflower coming into her own with adventures, dances, a grand proposal, and a hero who loves all the qualities that have gone unappreciated. The trio of schoolgirls who aid and abet includes not only Sally Fitzhugh, Turnip’s sister, but also her “particular friends,” the younger sisters of Alex and Jack Reid (Blood Lily) and Jane Wooliston (Pink Carnation). They are engaging characters, credible as schoolgirls but also filled with potential as heroines of their own stories. Fans will recognize several familiar characters, but the best of the secondary characters is Jane Austen, who is very much the witty and astringent Jane of her letters. But the book’s star and its heart is Turnip. Handsome, wealthy, genial, kind, boisterous, and smarter than he is given credit for being, he is an endearing, unforgettable hero. Willig includes Jane Austen’s Bingley, Georgette Heyer’s Ajax, P. G. Wodehouse’s Bertie Wooster, and Nigel from Jill Barnett’s Bewitching in her list of Turnip’s literary antecedents, with a nod toward Loretta Chase’s Rupert Carsington as a kinsman. He reminded me most strongly of Freddy Standen in Heyer’s Cotillion, although Turnip’s embroidered waistcoats would have horrified the sartorially elegant Freddy. But Turnip is an original not an imitation. 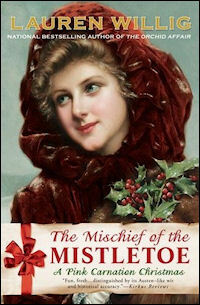 He’s also a darling, and The Mischief of the Mistletoe is a perfect confection for holiday reading—light, sweet, and finely crafted. I'm having a real 'thing' about covers today - yes I judge. A Christmas book should be this beautiful though. On my wish list. Oh I want to me Turnip, he sounds like a beta hero and I just love those. Isn't the cover gorgeous, Marybelle? It's the same cover as the hardback, and it won Cover Cafe's Holiday Favorites Contest last year. Another wonderful review, Janga! This one will be added to my Christmas tbr! I haven't read any of Lauren's books yet. Great review! This sounds like a wonderful read. I love reading books like this at this time of the year! Great review, Janga! I haven't read a Willig book is quite a while so maybe I should check this one out. Janga, I've enjoyed the Pink Carnation series and am happy to see Turnip get his own book. Thanks for the great review and for explaining where this fits with the others. Thanks, all. I'm pleased that you liked the review. I hope you all read it and enjoy it as much as I did. PJ, thanks for the plug for Just Janga too. I had fun writing about those shows. I've been Christmas shopping today, racing all over two towns trying to find the right Star Wars Legos and SpyNet toys. That's why I didn't get back here or on my own blog. Sounds delightful. I have this book on my TBR shelf and had forgotten it. Since I am reading just Christmas stories at the moment, this will be perfect. I don't think I will be able to wait until I have her earlier books before reading this one.